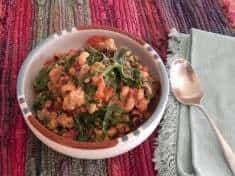 Richly seasoned with onions, celery and garlic, a flavorful tomato broth is the base for this thick stew of the traditional black-eyed peas and collards. 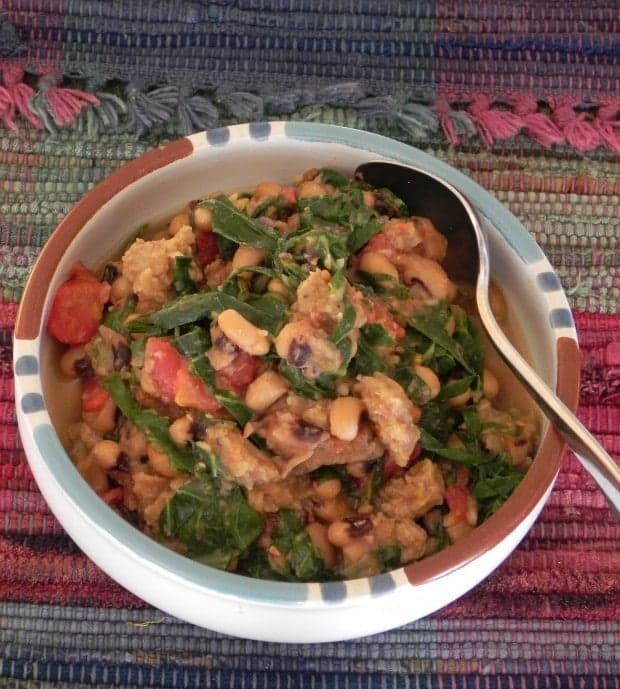 For health, wealth and luck, be sure to ring in the New Year with black-eyed peas and collards! Eating black-eyed peas and collard greens on New Year’s Day is a Southern tradition dating back to the Civil War. The idea is that black-eyed peas symbolize good luck and fortune, and collard greens represent money and wealth. I wouldn’t call it superstition, but just to be safe, I always make black-eyed peas and collards on New Year’s Day. With a pressure cooker or Instant Pot, you don’t have to soak the black-eyed peas beforehand. 11 minutes under pressure, and your black-eyed peas and collards can be done and ready in 40 minutes. If you don’t have a pressure cooker or Instant Pot, it’s best to soak the black-eyed peas. Plan on 2 hours cooking time. One New Year’s Eve I shopped so late there were no fresh collards to be found. 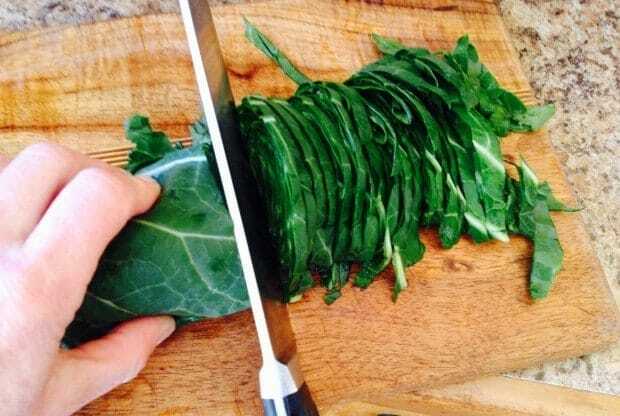 Lucky for my money the frozen section bore chopped collard greens! I made this recipe easy-peasy with canned black-eyed peas and frozen collards! Because tradition calls for some sort of pork, like bacon or ham, symbolizing a healthy year, this ripens an interesting discussion, especially for vegetarians. Everything I know says the more healthful route is to skip the pork, so I create the intention for a vibrant and fit healthy body and mix in sautéed chunks of pretend pork, sausage flavor. Serve your greens and beans with hot cornbread or green chile corn muffins. Stir rice into the pot and you have Hoppin’ John, another Southern US original. Or spoon these black-eyed peas and collards on top of steamed brown rice. You might enjoy these Hoppin’ John fritters with collards for your New Year’s Day dinner. 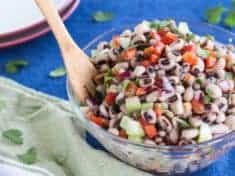 Or this easy Mexican black-eyed pea salad. Wishing you a healthy, wealthy and lucky new year. It’s going to be the best year, so far! 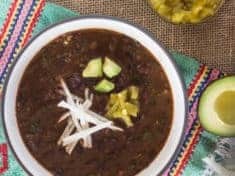 This recipe is made with dried black-eyed peas and the estimated Cook time below is for pressure cooking. If you are cooking dried black-eyed peas regular stove-top, add 6 hours soaking time and 2 hours cook time. 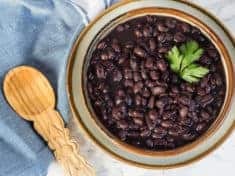 You may substitute drained and rinsed canned black-eyed peas--begin by sautéing the onions, celery and garlic, add the cooked beans along with the tomatoes and broth, and simmer 10 minutes. Makes about 8 servings. Rinse the beans and put them in a bowl, covering them amply with cold water. Let soak at least 6 hours or ideally, overnight. *** Skip this step if using a pressure cooker. Heat the oil in a large saucepan over medium flame. Add the onion and celery; cook and stir until the onion is translucent, about 10 minutes. Stir in the garlic and cook the vegetables a few more minutes. Rinse the black-eyed peas and add them to the pot, along with the water, tomatoes, bay leaves, oregano and red pepper flakes. The liquid should just cover the beans. Using a pressure cooker: Cook 11 minutes under pressure, remove from heat and allow pressure to release naturally. Using an Instant Pot, turn the top dial to Seal and set the timer for 11 minutes. Allow pressure to release naturally. For regular stove-top cooking: Bring to a boil; reduce to a slow simmer and cover. Cook two hours or so, topping with water as needed, until the beans are tender to a bite. Meanwhile heat the olive oil in a skillet. 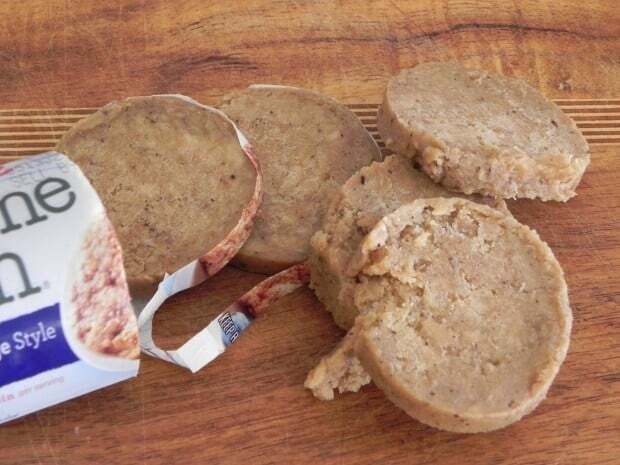 Cook the imitation sausage, breaking it into chunks with a spoon, until the “meat” is brown on several sides. Set aside. Stack the collard leaves one on top of the other and roll into a tube shape. Slice ¼-inch thick into ribbons. Or simply chop into one-inch square pieces. 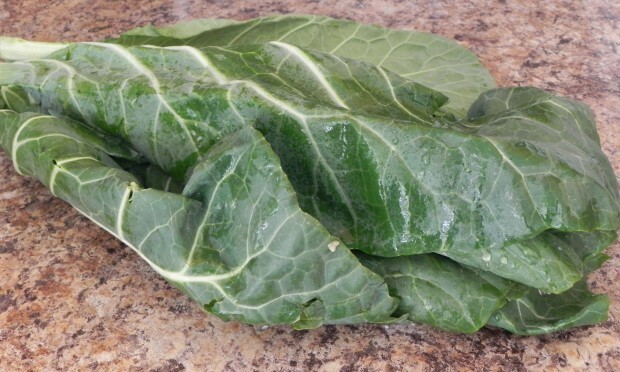 Bring a second pot of water to boil, add a pinch of salt and the collard ribbons. Cook 5 to 10 minutes, until the greens are tender. Drain and stir into the cooked black-eyed pea stew. Add the reserved sautéed “sausage”, salt and apple cider vinegar. Season to taste with more salt and pepper. *** Estimated Cook time is for pressure cooking. Without a pressure cooker--add 6 hours soaking time and 2 hours cook time if cooking dried black-eyed peas and collards regular stove-top method. 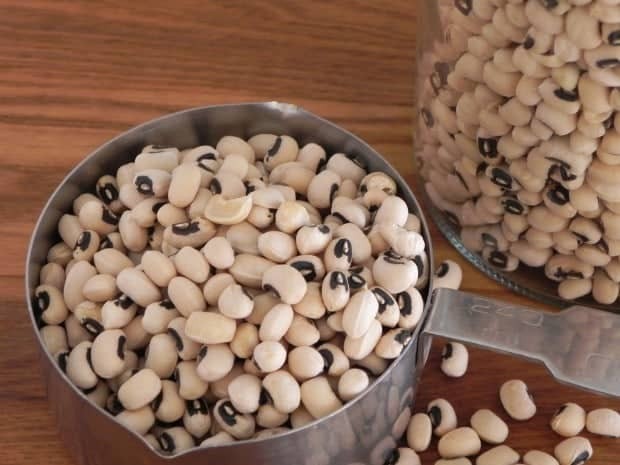 You may substitute drained and rinsed canned black-eyed peas for the dried peas. Using canned peas, begin by sautéing the onions, celery and garlic, then adding the cooked beans along with the tomatoes and broth. Let simmer about 10 minutes.